Transitioning to clean energy – for example, owning an electric car or installing solar panels – is commonly touted as a proactive measure for helping the environment. Last year, ECOSS conducted outreach on electrical vehicles to understand communities’ concerns about buying and owning electrical vehicles. Communities of color are overwhelmingly interested in clean technology, but they do not always have the information or resources to invest judiciously. ECOSS subsequently helped raise awareness of financial incentives and assuage concerns around vehicle maintenance. There are many models for community solar. A couple examples are (a) solar farms that people can buy into and (b) solar panels installed onto the roof of a public building for the benefit of those who use it. Now, ECOSS is expanding its clean energy program into solar. Similar to electrical vehicles, there are financial incentives for owning solar panels – namely the money saved from generating solar energy. But those benefits only materialize after purchase, thus creating a financial barrier. Community solar is one approach to lowering the financial barrier to owning solar energy technology. Rather than foist the upfront cost of solar panels on a single individual or household, community solar distributes that burden among a collective of stakeholders. Some projects involve residents buying shares of solar energy from a solar farm that reduce their utility bills. Others are centered on public spaces like schools. There are many models for community solar, but they all share a goal of democratizing solar technology. Outreach and engagement promotes community buy-in and more sustainable solutions. Photo Credit: Sam Le. ECOSS is teaming up with Spark Northwest and Emerald Cities to bring community solar to affordable housing — a first in Washington State. Spark Northwest is a leader in clean energy solutions, and Emerald Cities has extensive experience in working with low-income housing. These two organizations complement ECOSS’ expertise in community outreach and connections within communities of color. Who owns the project? The developer installing the solar panels? The housing authority? The residents? How will financial kickbacks be distributed? Should they be disbursed to individuals or collected into a community pool? When does ownership of the solar panels transfer to the community? As negotiations progress, ECOSS will engage housing residents to ensure that their thoughts and feedback are heard. If successful, this pioneering project can form the basis for community solar at other multi-family properties. Look forward to more news about community solar in the coming months! This is but a brief look into community solar. Learn more about community solar models through our partner, Spark Northwest. Tết is the Vietnamese celebration of the Lunar New Year. This year, ECOSS and I celebrated Tết with the Hoi Thanh Tin Lanh Hy Vong church. Kids were up and singing and the Pastor and members provided words of wisdom. After the service celebration was Tết dinner, featuring traditional food like bitter melon soup, braised pork and Banh Trung (glutinous rice wrapped with mung beans and banana leaves). True to ECOSS’ spirit, dishes were served with compostable dinnerware, helping the church reduce garbage waste. Tết dinner. Photo Credit: Sam Le. Compostable dinnerware for Tết dinner. Photo Credit: Sam Le. After dinner, we offered an education session with members and kids who came up to learn about stormwater pollution, the benefits of cisterns and rain gardens and the RainWise program. ECOSS set up to talk stormwater pollution with their watershed model. Photo Credit: Sam Le. Kid inspecting the watershed model, which illustrates the impacts of stormwater pollution. Photo Credit: Sam Le. For this event and others, I had the pleasure of working with Cindy Nguyen, who was an awesome intern with a bubbly personality. Cindy is a student at Colby College with an interest in environmental law. ECOSS intern Cindy Nguyen speaking to a church member about rain gardens and cisterns. Photo Credit: Sam Le. And over the last month, she helped deliver ECOSS and RainWise messages and resources to the Vietnamese community. Despite the short time frame, her hard work to perfect her Vietnamese and her commitment to community outreach was outstanding. Thank you Cindy for working with us and being part of the ECOSS family. Give today to promote environmental solutions in local communities and your gift will be doubled for #GivingTuesday! Multicultural Outreach Associate digging into his work, helping build a rain garden at Sylvester Middle School. Photo Credit: Leda Costa. Your donation will fund projects like our RainWise outreach, tackling Puget Sound’s #1 source of pollution: stormwater. 2018 marks the addition of over 200,000 gallons per year in stormwater management from RainWise demonstration site installations. “This year, the RainWise outreach team completed our first collaboration with a restaurant. Young’s Restaurant joins other important demonstration sites like Co Lam Temple and Pyung An Presbyterian Church to educate diverse communities about stormwater pollution and what they can do at home, like installing rain gardens and cisterns. Bhutanese hiking trip to Mt. Si. Photo Credit: ECOSS. Many immigrants and refugees appreciate the environment and want to protect nature, but are unaware of opportunities to do so in new surroundings. The New Arrivals program connects these new Seattle residents to environmental education, outdoor opportunities and more. Read about how and why the New Arrivals program focuses on multicultural outreach in this feature with the Social Innovations Journal! The New Arrivals program is generously supported by the Satterberg Foundation, the Rose Foundation and the Cuyamaca Foundation. Young’s family standing in front of their restaurant’s cisterns. Photo Credit: Sam Le. Equitable access to environmental solutions means reaching out to underserved communities. These are often the people most impacted by water pollution, air pollution and other environmental challenges, yet commonly face language and cultural barriers that hinder their ability to protect the environment. In partnership with King County’s RainWise program, ECOSS helped Young’s Restaurant become the first Seattle restaurant and business to be part of the stormwater pollution solution. And The Nature Conservancy’s City Habitats program recently featured this accomplishment! ECOSS recruited multicultural contractors for this project and helped both the contractors and restaurant owners navigate the RainWise program to install and maintain cisterns at Young’s Restaurant. Native planting for Duwamish Alive! Habitat restoration at the April 2018 Duwamish Alive! event. Photo Credit: Sam Le. 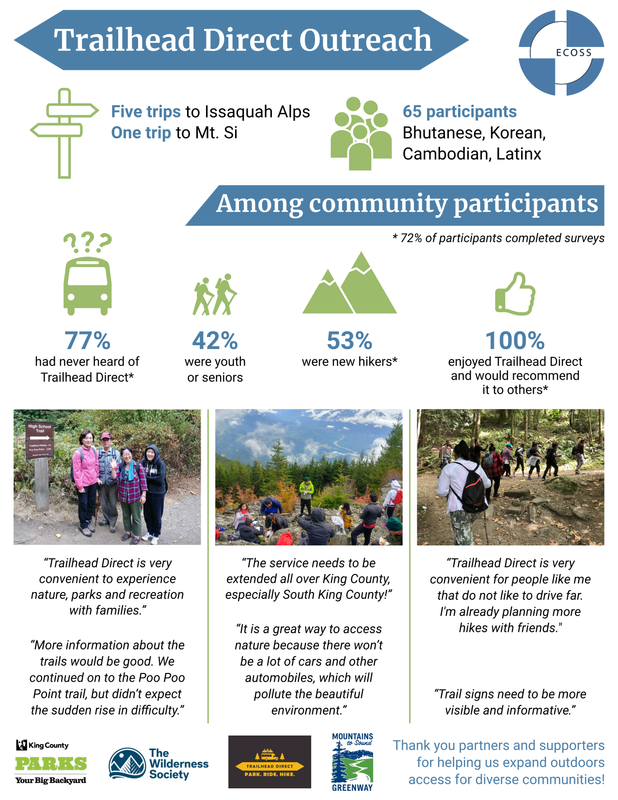 ECOSS is again teaming up with Mountains to Sound Greenway Trust to host a volunteer work party at the Duwamish Hill Preserve! Join us on October 20, 10 AM for a fun day of planting native plants and learning about your local environment.